ELECTRIC OVEN MODEL SATURNO ELECTRIC. Electric Deck Oven with independent chambers. Front and oven mouths are in stainless steel AISI 304, perimeter in stainless steel AISI 430 and oven coating in galvanized steel. – Cooking chamber in stainless steel with side-mounted armoured electrical resistors and 2 cm refractory floor base. – Powerful steam generators with temperature and water supply regulation and manually controlled steam release valves. – The oven is built on a base which has rear wheels so that it rests on three sides and so that it can be easily moved for maintenance work. – With cutting-edge power management control panels, the oven also has a control card which allows the user, through lowering or raising the set kilowatts, can reduce or increase the power used, for high temperature cooking, or for cold dough, such as pizza or frozen bread. – Power is automatically diverted when chambers or steam generators reach the required heat, and the oven sends power to the cooler chambers and steam generators, thus ensuring a stable and rapid temperature increase. – Each chamber is supplied with a card which controls temperature, baking time, roof / floor balance, oven mouth clearance and control of steam generator. – The oven is supplied with an easy to clean motorized steam hood, and LED light incorporated to optimize illumination in the loading area. One door of 800 with 3, 4 and 5 decks. Floor Base Depth 1.000, 1.250, 1.650, 2.050 and 2.450. (Measurements in mm). Two doors of 600 with 3, 4 and 5 decks. Floor Base Depth 1.000, 1.250, 1.650, 2.050 and 2.450. (Measurements in mm). Two doors of 780 with 3, 4 and 5 decks. Floor Base Depth 1.250,1.650, 2.050 and 2.450. (Measurements in mm). Three doors of 600 with 3, 4 and 5 decks. Floor Base Depth 1.250, 1.650, 2.050 y 2.450. (Measurements in mm). 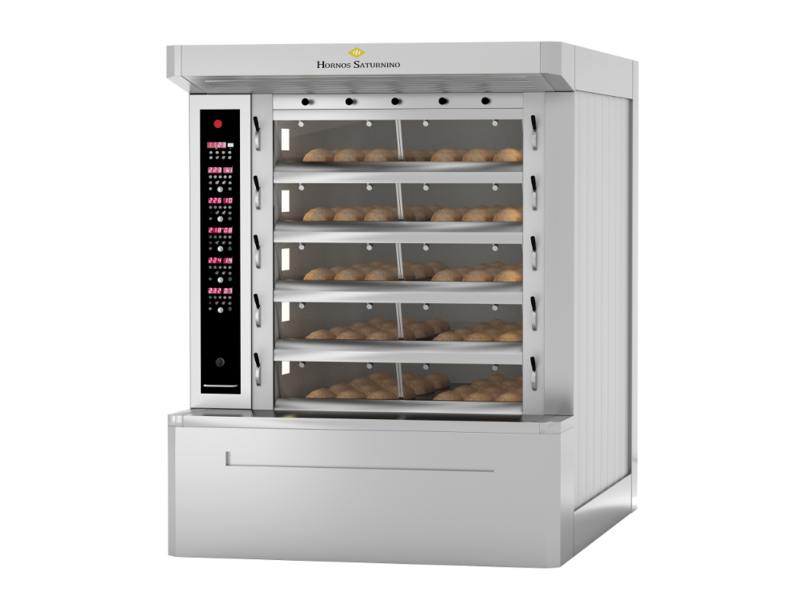 nextANNULAR TUBE OVEN MODEL STA.